The second Zoya Fleck Effect polish I have for you is Zoya Opal. 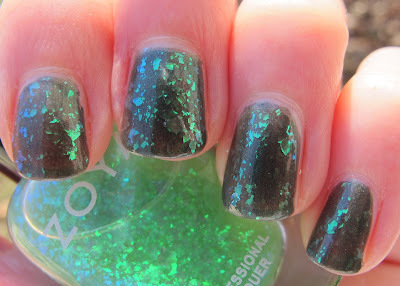 Zoya describes Opal as a "green tint with mylar green fleck effect". 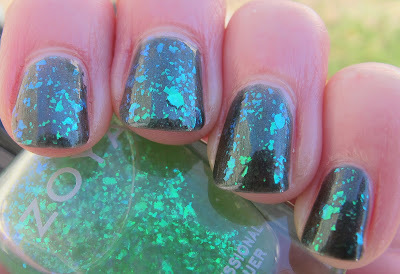 The green flakies are essentially the same flakies that are in Maisie, but in a different color base. I found Maisie's flakies to have a more glowing look, but that could be the base color I used. For this look, I did one coat of Opal over two coats of Zoya Suvi. Suvi looks a bit dusty, like acyual dust particles, so I think it dulled down the look a little. It may not have been the best base choice for flakies. 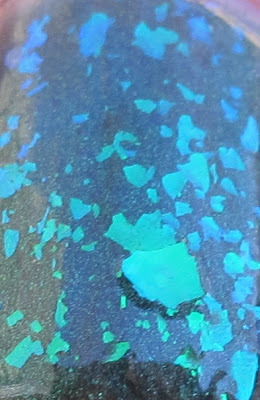 But, never fear, for I will be showing you these flakies over many other colors (I'm taking requests for base colors as well!!). I do really like these Zoya flakies. The flakes are large and plentiful in one coat. I hate having to pack on coats of flakies. They come off of the brush easily too, you don't have to try to coax them off. I think I may like Maisie a bit better, as the flakes looked more vivid, but Opal is gorgeous as well and I'm super happy to have them both!! I can never have enough flakies! The Zoya Fleck Effects collection will be available on Zoya.com on January 13th, although I think you can pre-order them starting on the 10th.